Yeah. I was getting my knitting out of the car and the ball of yarn fell out of the bag and rolled under the car. On the other end of that ball is me holding the back of my latest sweater project. I was about to retrieve the yarn then thought, "Wait a minute. The People need to see this ridiculousness.". So, I grabbed my phone from my purse and took a picture. Neighbors were looking, but I didn't care. I made myself look like a fool for you. The sacrifices I make. 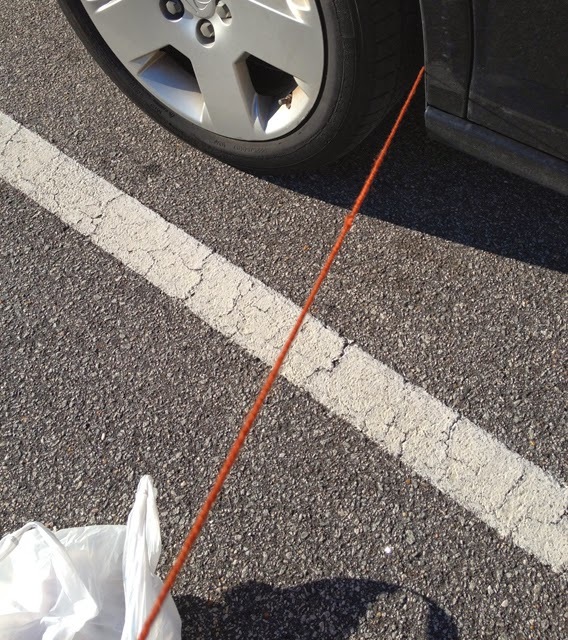 I didn't know this when I took the picture, but luckily, the ball of yarn rolled itself out from under the car, near the trunk. All I had to do was break the strand of yarn and retrieve the ball. Hissy fit averted. That sweater is going to be gorgeous. .. love. .. love the stitch definition. Very nice and nice voice. That should be a really popular pattern for the summer I think. I would make it if it were sold as a single. Happy your yarn was saved. lol.